Oral: 6 h., IV: 6-12 h., IV in children: 3 h.
Etoposide or VP-16 (trade name Etopophos) is a cytotoxic anticancer drug which belongs to the topoisomerase inhibitor drug class. It is used in form of its salt etoposide phosphate. Etoposide is used as a form of chemotherapy for cancers such as Kaposi’s sarcoma, Ewing's sarcoma, lung cancer, testicular cancer, lymphoma, nonlymphocytic leukemia, and glioblastoma multiforme. It is often given in combination with other drugs (such as bleomycin in treating testicular cancer). It is also sometimes used in a conditioning regimen prior to a bone marrow or blood stem cell transplant. It is given intravenously (IV) or orally in capsule or tablet form. If the drug is given IV, it must be done slowly over a 30- to 60-minute period because it can lower blood pressure as it is being administered. Blood pressure is checked often during infusing, with the speed of administration adjusted accordingly. When given with warfarin, it may cause bleeding. Etoposide forms a ternary complex with DNA and the topoisomerase II enzyme (which aids in DNA unwinding), prevents re-ligation of the DNA strands, and by doing so causes DNA strands to break. Cancer cells rely on this enzyme more than healthy cells, since they divide more rapidly. Therefore, this causes errors in DNA synthesis and promotes apoptosis of the cancer cell. 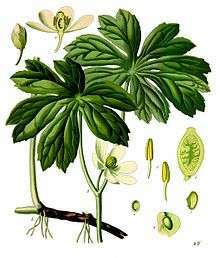 Etoposide is a semisynthetic derivative of podophyllotoxin from the rhizome of the wild mandrake (Podophyllum peltatum). More specifically, it is a glycoside of podophyllotoxin with a D-glucose derivative. It is chemically similar to the anti-cancer drug teniposide, being distinguished only by a methyl rest where teniposide has a thienyl. Both these compounds have been developed with the aim of creating less toxic derivatives of podophyllotoxin. The substance is a white to yellow-brown, crystalline powder. It is soluble in organic solvents. 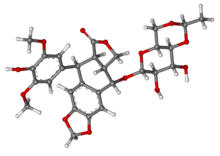 Etoposide was first synthesized in 1966 and U.S. Food and Drug Administration approval was granted in 1983. The nickname VP-16 likely comes from a compounding of the last name of one of the chemists who performed early work on the drug (Von Wartbung) and podophyllotoxin. Another scientist who was integral in the development of podophyllotoxin-based chemotherapeutics was the medical pharmacologist Hartmann F. Stähelin. 1 2 3 Hande KR (1998). "Etoposide: four decades of development of a topoisomerase II inhibitor". Eur. J. Cancer. 34 (10): 1514–21. doi:10.1016/S0959-8049(98)00228-7. PMID 9893622. ↑ Longe JL (2002). Gale Encyclopedia Of Cancer: A Guide To Cancer And Its Treatments. Detroit: Thomson Gale. pp. 397–399. ISBN 978-1-4144-0362-5. ↑ Pommier Y, Leo E, Zhang H, Marchand C (2010). "DNA topoisomerases and their poisoning by anticancer and antibacterial drugs". Chem. Biol. 17 (5): 421–33. doi:10.1016/j.chembiol.2010.04.012. PMID 20534341. ↑ Gordaliza M, García PA, del Corral JM, Castro MA, Gómez-Zurita MA (2004). "Podophyllotoxin: distribution, sources, applications and new cytotoxic derivatives". Toxicon. 44 (4): 441–59. doi:10.1016/j.toxicon.2004.05.008. PMID 15302526. ↑ Mutschler, Ernst; Schäfer-Korting, Monika (2001). Arzneimittelwirkungen (in German) (8 ed.). Stuttgart: Wissenschaftliche Verlagsgesellschaft. pp. 894–5. ISBN 3-8047-1763-2. 1 2 Dinnendahl, V; Fricke, U, eds. (2015). Arzneistoff-Profile (in German). 4 (28 ed.). Eschborn, Germany: Govi Pharmazeutischer Verlag. ISBN 978-3-7741-9846-3. ↑ Kuhn M, Von Wartbung A (1967). "Podophyllum- Lignane: Struktur und Absolutkonfiguration von Podorhizol-β-D-glucosid ( = Lignan F). 19. Mitt. über mitosehemmende Naturstoffe ". Helvetica Chimica Acta. 50 (6): 1546–65. doi:10.1002/hlca.19670500614.